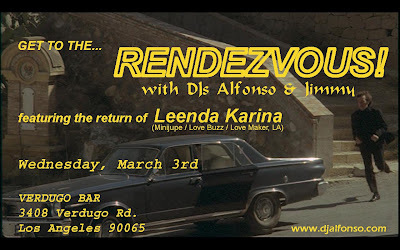 We just couldn't get enough of Leenda Karina at our last RENDEZVOUS!, so on Wednesday, March 3rd, she'll be be back! Leenda's got the grooviest selections of international freakbeat, US garage, UK psych, and other audio delicacies - all packed into a cool little 45's record box. If you missed her on the 15th, now's your chance to catch her amazing DJ set(s)! As always, your resident agents will pollute your ears with their assorted array of Turkish & Persian protest pop, psychedelia, space-age cosmic weirdness, Euro soundtracks, and live re-edits. We will also be screening two 60’s b-movie legends: Soledad Miranda in "Vampyros Lesbos," & Jean Gabin in "Le Pacha."